Description: This nudibranch is a spiky Doto species, similar in colour to Doto fragilis but with ceratal tubercles conical in shape, tapering to a sharp point. The rhinophore sheaths are characteristic, the rim being drawn out into a series of points. Habitat: This is a scarce species, found feeding on the plumulariid hydroid Polyplumaria frutescens, in deep water, usually below 25 metres. 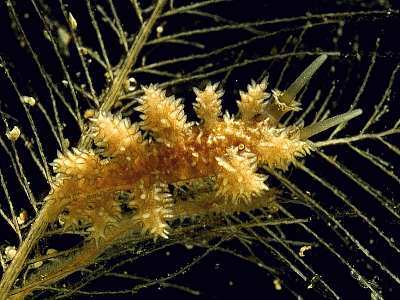 This hydroid is usually found on rock, in moderate to strong tidal streams in clear oceanic water. 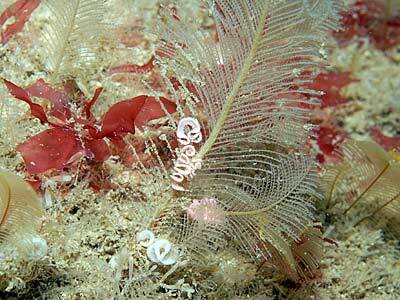 The spawn is a typical Doto concertina, laid on the stem of the hydroid, it is often pale pink in colour. Distribution: Widespread in the British Isles but rather local in its occurrence. Known from Skomer Is. ; Gasconane Sound, Co Cork and scattered localities in western Ireland and Scotland. Probably found wherever its food is plentiful. Cerata without spots, with long, pointed tubercles. Rim of rhinophore sheaths with series of points. Picton, B.E. & Morrow, C.C. (2016). Doto hystrix Picton & Brown, 1981. [In] Encyclopedia of Marine Life of Britain and Ireland.